Wine refrigerators, also referred to as wine coolers, are designed to store wine bottles in a way that will elevate the taste and integrity of your wine while also helping it to last longer. Although wine refrigerator types are almost as varied as the types of wine, here is an overview of factors to consider when searching for your perfect storage solution. Freestanding wine refrigerators are meant to be placed anywhere that is convenient for you, except in an enclosed space. Since they typically vent from the back, they will quickly overheat if placed in a tightly confined space. Freestanding wine refrigerators also have fully-finished cabinets, which mean that they will look attractive and polished even if both sides are visible. The Koldfront 24 Bottle Free Standing Dual Zone Wine Cooler is a great example of a freestanding wine refrigerator that offers efficiency with design that seamlessly blends in with your decor. If you place a freestanding fridge inside an enclosure, it is recommended that a space of at least 2-4 inches on each side are left open, allowing for adequate heat dissipation. Built-in wine refrigerators are meant to be placed under the counter or built-in flush-with-cabinetry. 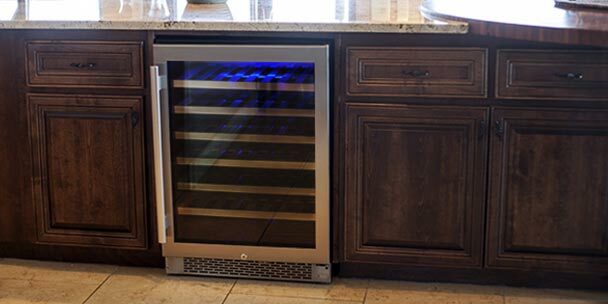 This popular type of wine refrigerator features ventilation in the front, allowing the heat to properly dissipate and still be seamlessly built into the tightest of all spaces. The ideal fridge for budding wine collectors, the EdgeStar 26 Bottle Dual-Zone Built-In Wine Cooler is an example of a built-in that can make the most out of limited spaces. If you know that you won’t need to place your wine refrigerator in an enclosed space, then a freestanding unit is likely the better choice for you. However, if you know you will want to have your wine refrigerator built-in or placed under your counter, you will want to be sure to look for a front-venting built-in unit. 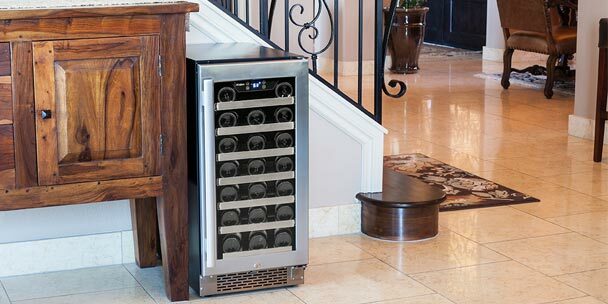 Single zone wine refrigerators have one temperature zone, controlled by a single adjustable thermostat. 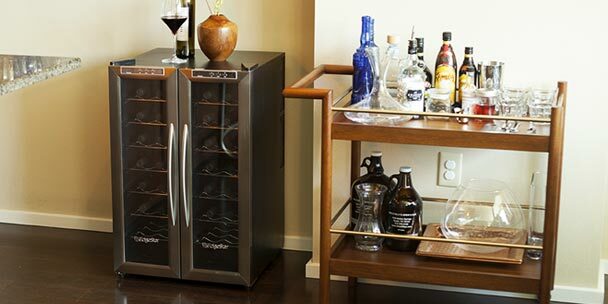 Dual zone wine refrigerators have two temperature zones, each individually controlled by a separate set of controls. Dual zone wine refrigerators are perfect for keeping two different types of wine stored at different temperatures yet within the same unit. 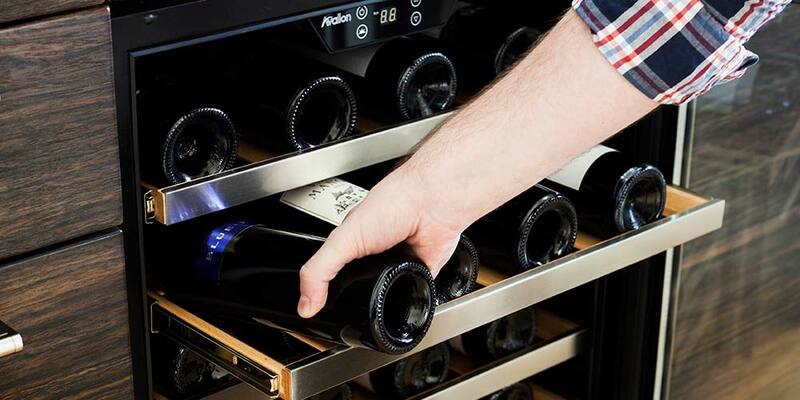 If your wine collection has only one temperature requirement, a single zone wine cooler like the EdgeStar 30 Bottle Built-In Wine Cooler is for you. However, if you know that you’ll want to keep two very different wine types that each need separate storage temperatures, then a dual zone unit is your best option. For storing red and white wines at their preferred temperatures, a wine cooler like the EdgeStar 46 Bottle Built-In Dual Zone Wine Cooler is a good choice for an expanding collection. Wine refrigerators that are thermoelectric are typically smaller than compressor-cooled wine refrigerators. Thermoelectric cooling is quiet and energy efficient but not strong enough to cool a large capacity unit. Small wine coolers and freestanding units are most commonly thermoelectric, while larger units and built-in units are most commonly compressor-cooled. 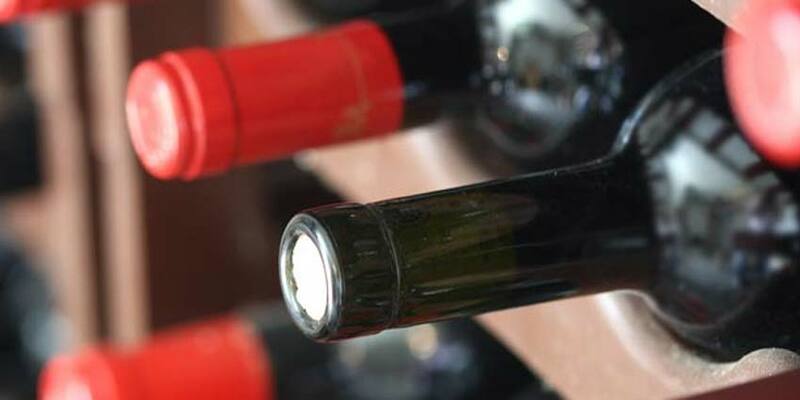 Compressor-cooled wine refrigerators are able to withstand higher ambient temperatures and higher capacity units than thermoelectric units, keeping wine at consistent temperatures no matter the exterior variables. Now that you’ve got the basics down, you are ready to find the perfect wine cooler to meet your wine storage needs. We’re looking to fill a space where an ice maker now stands. A shelf would extend over the top. A wall to the back and both sides. Roughed out dimensions are as follows. 34 inches height, 16 inches width and 21 inches depth. Reading the criteria it sounds as if we would need a unit that vents the heat from the front. the size and cost of the Edge Star stainless steel 21 bottle cooler would suffice. Does this come with front vent or what do you suggest? Thanks.